Is the Philippine IR Discipline Ready to be Disciplined? 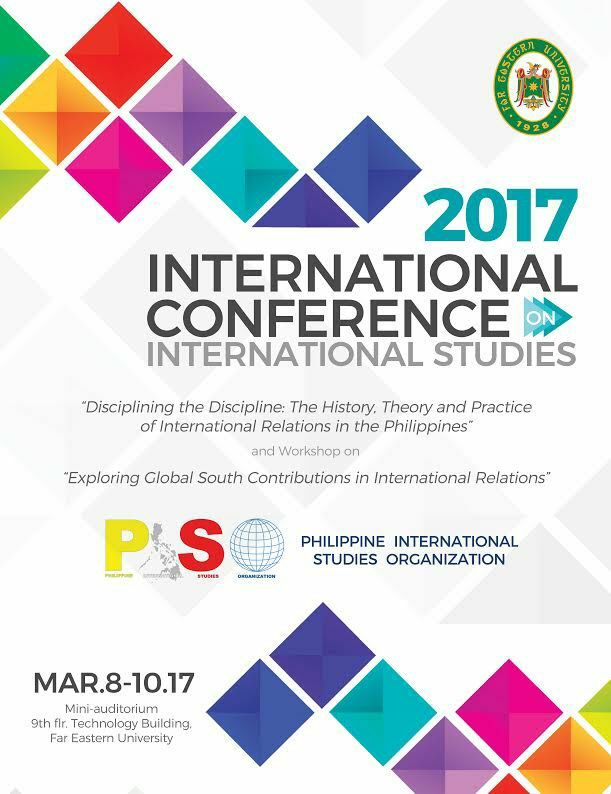 MAKATI CITY (MindaNews /13 March) – Through a last-minute intervention by a mighty Pen, I was able to attend the 2017 founding Philippine International Studies Association (PhISO) International Conference on International Studies held at Far Eastern University (FEU), Manila. Simultaneous with the conference presentation of papers was the holding of a workshop with the theme “Exploring Global South Contributions in International Relations” in collaboration with Global South Caucus on International Studies (GSCIS) by the International Studies Association (ISA). Aimed at serving as a critical academic platform “for thinking and doing IR differently and beyond the Global North’s IR perspectives,” the workshop advances “cosmologies of diverse ways of contemplating the ‘international’ as a form of study, discipline, and reality,” PhISO website would inform us. Inspired by postmodernist Richard Ashley’s critique of ‘anarchy problematique’ in existing IR literature, my workshop paper examined the Qur’anic concept of ‘mustad‘afin’ (the downtrodden) as expounded by the Islamic Republic of Iran’s founder and reflected in the Iranian constitution vis-à-vis the Westphalian notion of nation-state sovereignty. The paper presentations in both the conference hall and the workshop room were delectably peppered by two roundtables – “The Philippines and the International” and “Pedagogy, Curriculum, and Syllabus Development of International and Global Studies” – as well as three keynote speeches given by UP Diliman IR/IS professors, Dr. Clarita Carlos, Dr. Herman Joseph Kraft, and Prof. Frances Antoinette Cruz during the Opening Ceremony, Welcome Dinner, and Closing Ceremony, respectively. Outside the walls of the conference hall and the workshop room, I would spend my light moments chatting with other participants or members of the secretariat beside the registration and information table, sipping hot coffee at the snacks room, or flipping through selected books at the book exhibit participated in by SAGE Publications, University of the Philippines Press, Ateneo de Manila University Press, De La Salle University Publishing House, University of Santo Tomas Publishing House, Far Eastern University Publications, Ateneo de Davao University Publishing Office, and Vibal Publishing. For me, the center of attraction in the book exhibit was the booth of Liberland. Proclaimed for the first time on April 13, 2015 by a Czech right-libertarian politician and activist, the seven-square-kilometer Free Republic of Liberland, as I learned then for the first time, is a ‘sovereign’ state located between Croatia and Serbia on the west bank of the Danube river – though receiving no recognition yet from any member of the United Nations! The ground-breaking conference, successful as it was, all started with a single person – the PhISO founder who is a young Mindanawan. As revealed by Prof. Carlos in her keynote speech, whenever she would meet him abroad many years back, her former student would never digress from talking about a national international studies association in the country. For me, more impressive than founding PhISO itself is his conspicuous magnanimity in not styling himself the founding president. He just settled with the vice presidency on publication, a position he is much competent in given his external publication experience and linkages.